The fifth European national bailout pertains to Cyprus, where receipt of the bailout money is contingent on the confiscation of money directly from people’s bank accounts. The government will take 6.75% of the deposits of anyone with under 100,000 Euros. And they will take 9.9% of anything over 100,000 Euros. The people will not send in this money, it will be taken directly from their accounts on Tuesday if the Cypriot legislature approves the bailout plan. If a word to the wise is sufficient, one can only hope that more will gain wisdom from this event. One German newspaper is already suggesting today that a 15% “wealth tax” be levied in Italy to help with its debt problem. Jim Sinclair (there is always a link to his web site JSMineSet.com on the Thundering-Heard BlogRoll) held lots of gold in the precious metals bull market of the 1980’s, riding the price from $40 to $850 per ounce. He sold his holdings on the very day of the top price in 1980 and thus entered the ranks of investment legends. In 2003, he started a web site and went public with the prediction, which he reiterated many times in the years that followed, that gold would rise from its 2003 price in the mid-$300’s to $1,620 per ounce by January 2011. He was roundly derided for both the predicted rise of the price and for the precision of the predicted timeframe. It turned out he was off by 8 months: gold’s price did not rise to $1,620 until August of 2011, not January. 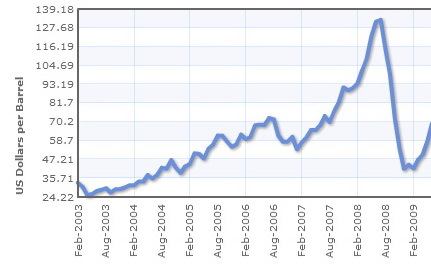 The gold price in dollars has been in a sideways correction since late 2011. Recently, Jim has been pounding the table that the current sideways movement in the gold price will be complete before the end of this month, March 2013, and begin its next phase of upward price movement to $3,500 per ounce and beyond. When Jim makes predictions about gold, it pays to listen. Notice that sideways price drift at the top right of the chart? Chart readers call this a “correction in an ongoing bull market.” It’s a bull market taking a breather before powering higher. Notice the parabolic upmove as price increased 15-fold in less than 10 years and then: SPLAT! A high-speed drop of 78% in just over two years. 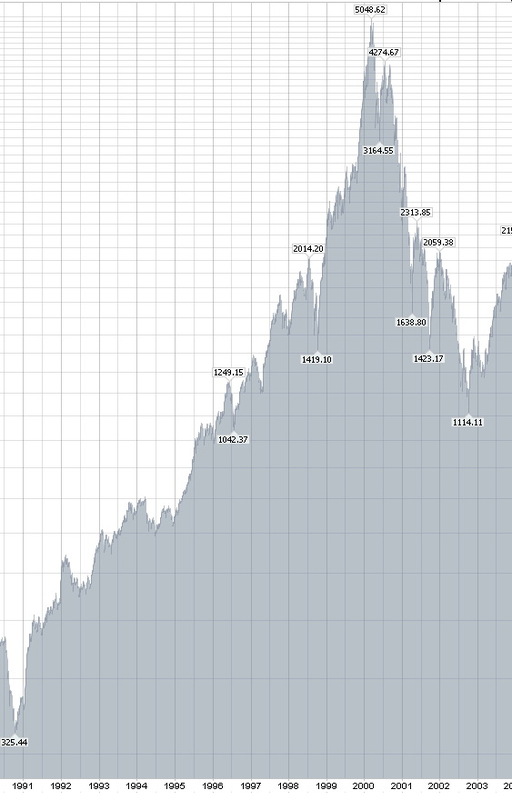 Thirteen years and trillions of printed dollars later, the Nasdaq is still 36% below that all-time high price. Note in both of those cases, no sideways price movement for months and months, as is seen on the gold chart, just a sharp fast very-nasty price crash. I think Jim Sinclair is correct. I published back in June 2012 (What then can we do?) 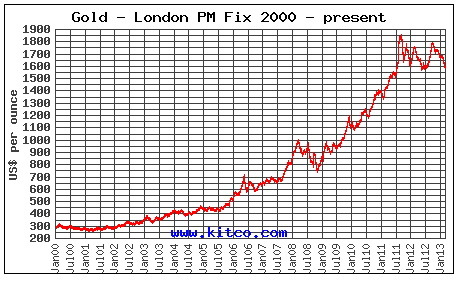 that people might want to complete their conversion from paper/electronic currency into gold by August 2012. That was a good idea. But cycles research at the time showed that it was possible that we would get one more price downmove, into March of 2013 at the latest, so I did not label that Summer 2012 opportunity as the “last chance” to get gold at a decent price. Now price has come down again into that same area where it was during the Summer of 2012. This time I think that “last chance” phrase is appropriate. Jim Sinclair says, and I agree, that after this month, you won’t ever be able to buy gold anywhere near $1,600 per ounce again. This entry was posted in Financial System and tagged bank runs, Cycles, financial system disintegration, gold, precious metals by Thundering Heard. Bookmark the permalink. Let us hope that more people will finally wake up and realise that we are like muppets at the hands of the few. As long as we do nothing, this is what we are going to get, as in the case of my homeland, Cyprus. SOme short-sighted, “well meaning” little people who should be let and not lead, have decided to take peoples’ property – their money- without their consent. What’s next then?? If this is happening in a EU country, it can happen anywhere. We cannot depend on governments for our wellbeing. Thanks TH, and Stavros… I’ve put this off long enough. Already have my account with Tulving, and will pull the trigger this week!